Completed my first DIY project for the blog!! Go me! I started by peeling the labels off all of the jars... which was not fun... but nothing a little Goo Gone (Target dollar section) couldn't handle. Next in a separate mixing bowl combine Mod Podge and food coloring. I used dixie cups and craft sticks to mix, and I did not measure (just plopped it all in there). I did not add any water to mine but I have seen other people do so. It's really up to you. For my colors I wanted different shades of blue, teal, turquoise... whatever you would like to call it.. but I also saw some pretty brown and green versions that you could try as well. For each jar I used a different cup to get different colors. I used the blue, green, and yellow food coloring the most but in one batch I used a couple of drops of red as well (this jar turned out the darkest). After mixing well, just pour it in the bottom of your jar and start swirling it around until the entire jar is covered. I did this over paper towels to minimize the clean up. Once the entire bottle is covered, place it upside down on a baking pan to dry. I placed wax paper down first then two layers of paper towels on top of the backing pan. This made for a very easy, mess free clean up. After you have finished all of the jars let them sit upside down for an hour (I went and laid out in the sun for an hour!) All of the extra Mod Podge will drip down and puddle at the bottom. After the hour is up, flip the jars right side up (they will still be wet) and place them on a clean piece of wax paper on the baking pan. Bake them for 45 minutes at 225 degrees. Because my wine bottle was so large it had to bake for over an hour. I just pulled out the other jars and left it in longer. Hi - I'd love to try this - do you know if these can have water in them after this treatment, for flowers? Or are they best kept dry? Is it 225 degrees Celsius or farenheit? Great job! I'll definitely try this. Thank you. But I'm just wondering.. Is it 225 degrees Celsius or farenheit? I'm pretty sure it's ferenhiet. I tried this & mine were a mess. It looked like the modpodge melted & ran everywhere. Some of the glass had nothing & some had blobs. What did I do wrong? Thank you joyced, I've tried it already and I used 100º Celcius! But it didn't work for me either. All was good, until I put them on the oven. When I flipped the jars right side up they some places were dry and some were still wet and run to the bottom.. the result was really bad. Next time, I will let them dry in the air upside down! What a nice DIY! I was looking for such jars in stores (in that color) but couldn't find them. Now I'm just gonna make them myself! Do you know what exactly you did (type of coloring, how many drops of each,etc) to get the deep blue and the bright Tiffany-like blue color? Also wondering if I can put water in them. I followed the directions to a T and they turned out out perfect! (225 degrees Fahrenheit). Has anyone put fresh flowers in with water? Otherwise I'll just use them for dried flowers. Thanks! I recently did a project like this with the Mod-Podge but did not bake mine. I just let them sit for several days and they are beautiful. It took about 5 days for the Mod Podge to completely dry. I used the glass beads and artificial flowers in my jars, wrapped some jute around the rim, and they really looked nice. I think I read somewhere that you cannot use water in them though because it will cause the Mod-Podge to run. 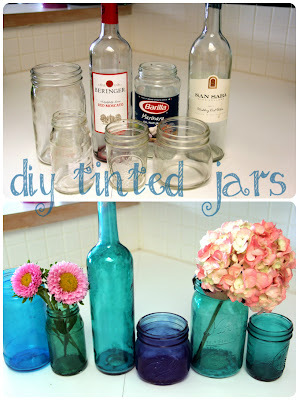 If you want to use water in them paint the outside of the jar with the Mod Podge or acrylic paints. I didn't think this would work but it did! I baked it at 225 fahrenheit. The two bottles that I added a little water to the mix did NOT get tinted, it needs to be just modpodge and liquid food coloring. I think you have to work fast to fill each jar or bottle with thick tinted mod podge, turn it a lot so the coat is even and dries a little (thickens) as you turn it. So spend some time on each one instead of trying to do many at once, let it get a nice even coat, and then dry upside down so you don't get a thick layer on the bottom -- also move them from place to place as they dry so you don't get a puddle at the neck. When I put water in them for some flowers, they turned chalky again! So, I dumped out the water and let them dry, and they went back to being transparent! Maybe I should've waited a bit so they'd dry out more -- but I also think it has to do with having a thick layer of the modpodge on the bottom because they weren't inverted for the whole drying time.